This is the companion book to The Boy's Own Book which is discussed elsewhere in this listing of Facsimile Books. About the same dimensions as the boy's book, i.e., about 4 1/2 inches wide by about 5 1/2 inches tall, it is full of entertaining activities. Although published more that 25 years before the civil war, this book went through several printings without revision. 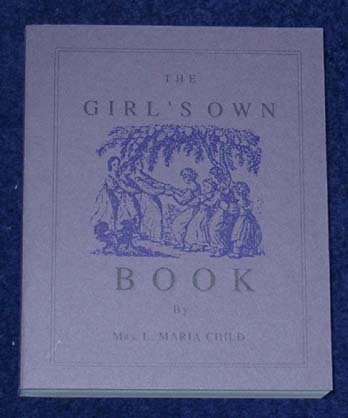 Further, books such as this were passed down to younger children so it was almost certainly still in use during the civil war period. Taking up almost the first third of the book are games. Like many children's games of the time, they require very little or, more often, nothing in the way of special equipment, only needing willing players. There are games of action -- although the most energetic is still not as boisterous as the games for boys -- as well as games that exercise the mind and memory. Other sections of the book contain craft projects, puzzles, conundrums, and riddles. Even though almost 170 years have passed since the book was first published, elements of it are still entertaining to today's children. The book is also useful for historic interpreters planning children's activities.